Chloe was injured on May 9th and it has been a LONG road to recovery. She had surgery following the accident to save a toe, lost 4 toenails… and it has been “3 steps forward and 2 steps back” ever since! Our biggest problem was getting her to leave the surgical site alone. Chloe is very smart. Chloe has been trained by the best. 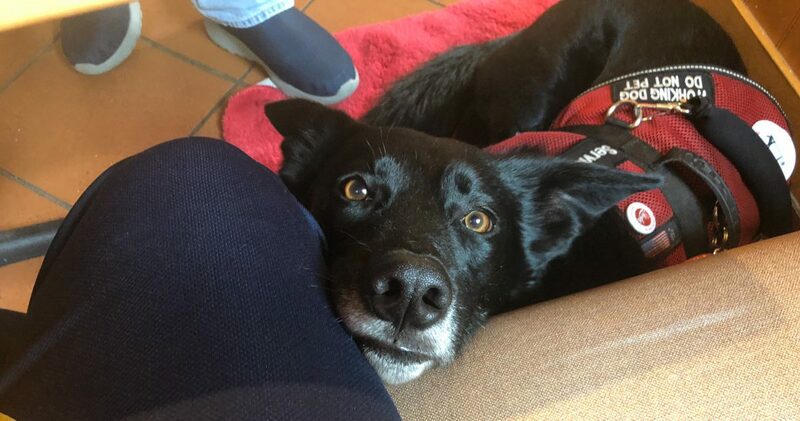 Chloe attends Fidos For Freedom for follow-up training and polishing. But Chloe? Well… she’s still a DOG. We were given a very nice cone similar to the one in the picture above. The only problem was that Chloe would go BERSERK when I put it on her. During the day, I could simply keep an eye on her while I was working at my desk. However, at night I needed a little assistance. The CONE was suppose to be my assistance. 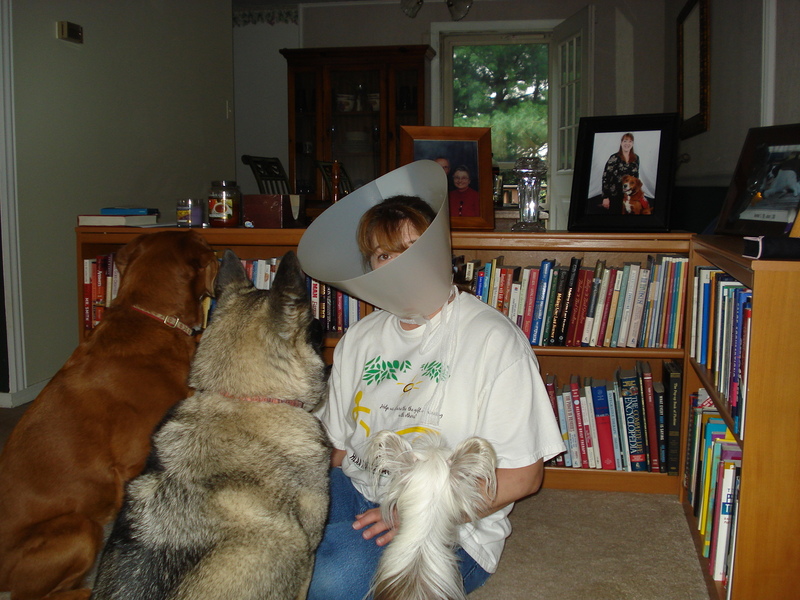 Every time we put the “cone of shame” (a line from the animated movie UP! ), she went crazy… running into walls, dashing her head around, and inevitably breaking open the cauterizations and stitches on her foot. We ended up having to use “Bitter Apple” instead. This saved my life actually! I wasn’t getting a “wink” of sleep and was seriously near a nervous breakdown from fatigue. 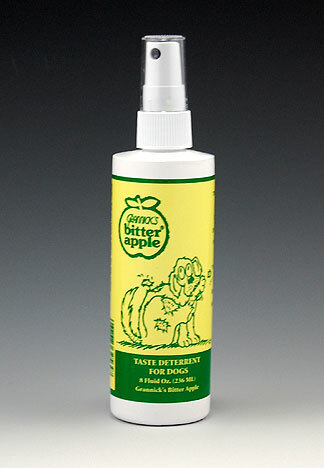 One of my daughter’s friends at work recommended “Bitter Apple”, and it only took a few sprays for Chloe to LEAVE her FOOT ALONE! All night! (Thank you GOD… quite literally!). I think part of the cone’s drawback was that it wasn’t transparent. Chloe couldn’t see to the right or left… all she could see was what was directly in front of her. It made her panic – the NOT knowing what was around and about. She could hear our voices, but her world had suddenly become very small. It was only as big as what she could see out the end of the cone. You can’t very well explain to a DOG why they need a cone on their head. If you could explain that… well GEE! You could probably reason with them about why they should leave a surgical site alone! We could not explain to Chloe that the cone was for her own good. 1. The speed limit. It’s not there to challenge you to see if you’ll get caught speeding. It’s there to protect you and others. 2. Exercise and eating right. How many thousands of Americans re-commit each January to make this change? It’s not because getting sweaty, pumping “iron” and eating fruits and vegetables are a lot of FUN. But we’ll live longer… and probably feel better too. 3. The 10 Commandments. Yeah, I know… it’s OLD TESTAMENT. But aren’t these things we should all continue to strive for even as “New Testament” believers? If you are a person of faith it normally means there is something different about you. If you covet, steal, murder, and hate, it is YOU who is scarred and broken in the end. Those “commandments” are for your good. 4. Taking medicine. Blech. But if you are sick, do you not take medicine when it may be what stands between you and good health… or life? 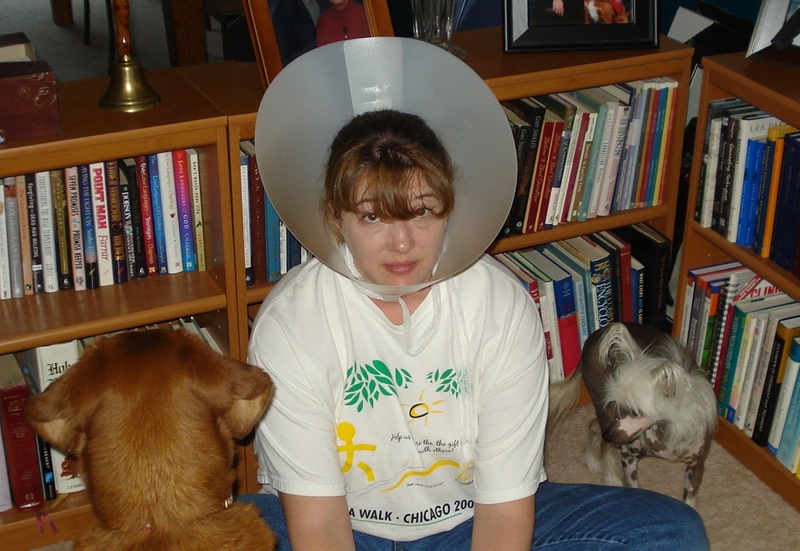 All 3 dogs were very concerned about my donning the "Cone of Shame"
I tried on the “Cone of Shame”. (Does that make me “game” or nutty?) The dogs were very concerned as you can see. All 3 sat in front of me and Chloe whined and breathed hard in my face every time I turned her way. It was very disconcerting to not be able to see around. I believe that a “cone” is a good representation of how difficult it is to put your faith and trust in something or Someone that you can’t see. I have never seen God, yet He’s as real to me as anything I have ever experienced. I see Him in His creation. I see Him in the service and love of others. I see Him in answered prayer… even when He says “no”. Yet, I’ll admit to a major frustration in my faith walk. It is really hard not knowing what tomorrow may bring. It can be very disconcerting to have a disability that may be progressive. It can be frightening to have an invisible disease like fibromyalgia, Meniere’s disease, or hearing loss. Have you ever been told “you’ll only get worse”? That knowledge can make it really difficult to have dreams and hope to see beyond “today”. We have to trust that what we have access too is enough for now. We should reach out to others and form strong relationships. We should research, prepare and educate ourselves. We don’t have to run around in a panic with this “cone” we didn’t ask for! Can you calmly and in faith, believe the “cone” is for your own good? I have a “short-term” goal and a “long-term goal”. I strive hard to make every minute in pursuing both worthwhile. I know God has a plan for me that is not fulfilled as of yet. I know this because I am still here. It can be very frustrating sitting around with a “cone on my head and heart” — not able to see the big picture that God has access to — since He PAINTED IT. I know keeping my eye on the short-term goals are important. It’s good for me. It keeps me focused, on track, and “real”. Yet I really want to be able to see 360°. 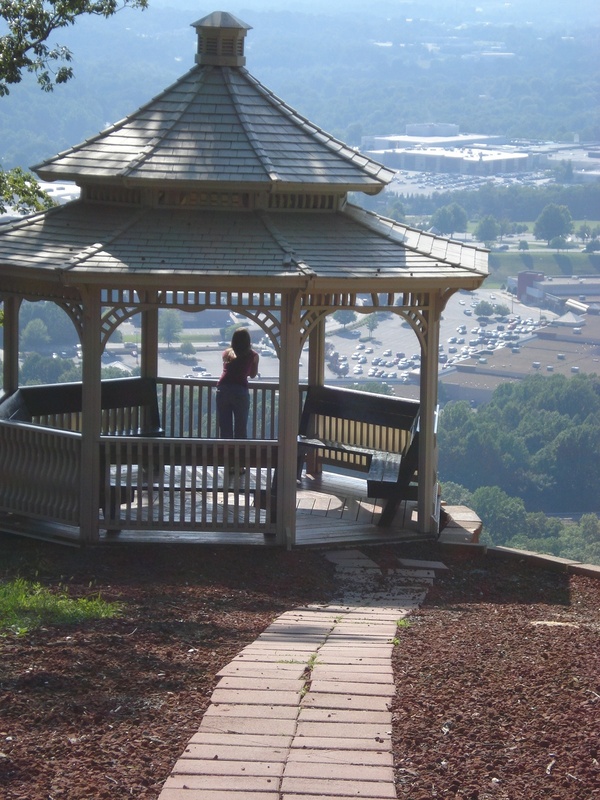 I realize GOD can see the big picture… that’s what “omniscient” means… all knowing. I have to have FAITH that what I’m allowed to see and make sense of RIGHT NOW is enough. Having that “cone” on is for my own good. It may not be very comfortable, but we have to believe that God has our best in mind. 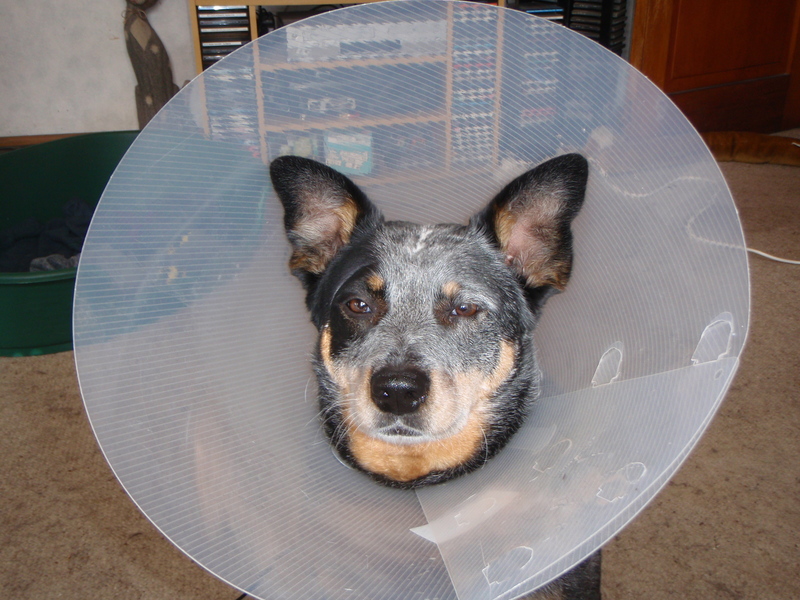 At some point… I’m going to see beyond the cone. 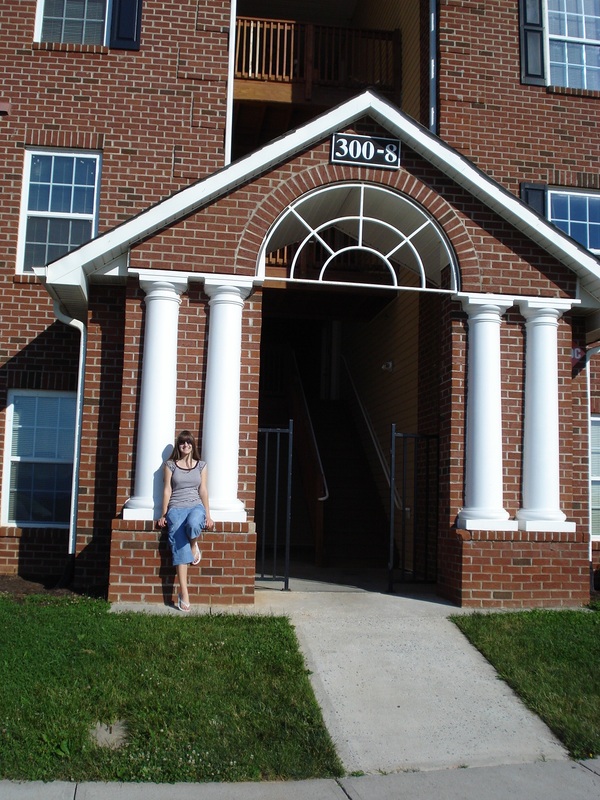 Kyersten standing in front of her new dorm at Liberty University. This past weekend my husband, firstborn and I headed to “Summer Orientation” at the college my daughter is transferring to this fall. She will be transferring in as a junior and we came to complete the remainder of her check-in requirements and participate in some on-campus meetings. I’ve been deliberately and methodically choosing not to think about this fall and the impending separation from my firstborn. I’ve always been pretty good at that and it keeps me from perseverating about unpleasant events. However, attending meetings about “how to let go” and how to encourage independence, forces the issue to the front of my mind. Because of the forced concentration on this coming fall, I came to a startling discovery. I’m actually going to be OK! Kyersten is confident and excited. She received fantastic scholarships and is lined up for Work Study. One of Kyersten’s roommates is a young lady who graduated high school with her. Elise will be transferring in as a junior as well. I have easy access to email, SKYPE, Facebook, cell phone, and texting. I may shed a few tears after dropping her off this fall, but truthfully I am more excited than devastated about our family beginning a new chapter. We’ve prepared for this and we are ready. I have faith that God will keep her in the palm of His hand. I can let go – and let God. I’m not as good at that about all things, however. Some things I find it more difficult to… “let God”? 2. Hearing: I am truly blessed to have bionic hearing and experience daily the miracle of “hearing again”. Each morning when I slip my coil magnet into place, I am reminded of the miracle of hearing again. A confession? I always fear “how long will this last”. Perhaps it’s because I experienced profound deafness for a couple of years prior to implantation. I know what it means to not be able to hear and communicate well. It had such a devastating effect, it left invisible scars on my heart and mind. 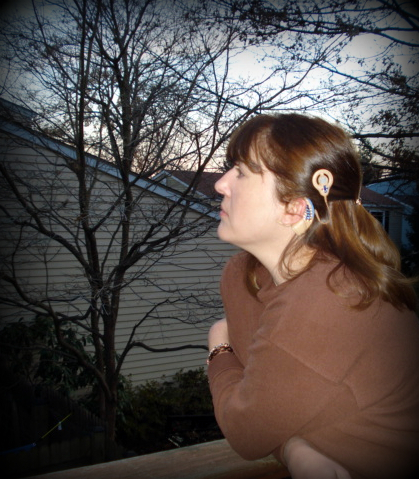 I am implanted with the “most reliable” cochlear implant on the market. Yet because of FEAR, I always get a hitch in my breath right before I connect the magnet each morning. I have trouble letting go of this fear… and letting God give me the confidence that He is in control. Do you have trouble letting go – and letting God? I believe it is because there is a small part of us that wants to control our own destiny. In some ways, if we are the only ones in charge of our destiny then we are the only one responsible for the outcome. But is that true? Reality check: Decisions OTHER PEOPLE make often impact our lives and our future. Natural disasters can have an influence. A devastating health diagnosis can impact our future – our very life. Stock markets crash, wars continue, the housing market may plummet. Someone we love may be killed by a drunk driver. People may be robbed, raped or murdered. Nothing like painting a rosy picture for you, huh? GRIN. The good news? God is in control. John Ortberg said, “Peace doesn’t come from finding a lake with no storms. It comes from having Jesus in the boat”. I don’t think we can truly “let go – and let God”, if we aren’t in the habit of daily interacting with the God who loves us. You cannot think about God part-time and expect His peace full-time. I love studying and using the names of God in my daily interactions with Him. The names of God remind us of all the things He IS. These reminders make it possible for us to “let go – and let God” with confidence. I encourage you to make a list of things you have trouble letting go of and discussing them with the One who really cares. I still have two big issues that I have trouble letting go of… yet learning to release these worries daily create a confidence that I can feel is growing. My hope is that I will one day realize I have truly “let go”. 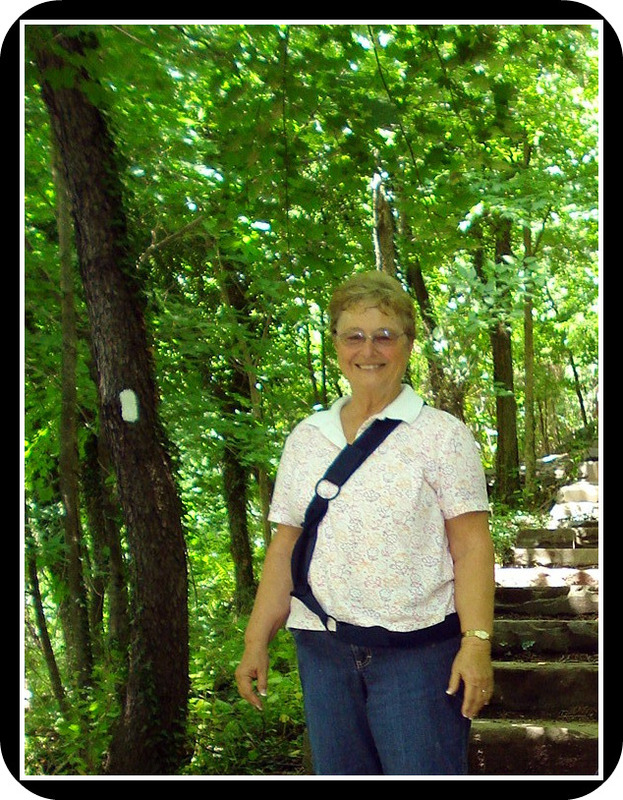 My Mother at Harper's Ferry, WV, in June of 2010. My parents came to visit last week as they wanted to attend my son’s graduation. They live in Florida, so it was great they could stay awhile after Chris’s ceremony as we don’t get to see them that often. Mom and Dad live in a gated community in Florida. They play cards there… a LOT of cards. When they come, they often teach us a new game. That may seem pretty “ho-hum” to most of you, but I grew up in a household that played ROOK and Gin-Rummy. That Mom and Dad come and teach us brand new games with elaborate sounding names like Shang-hai Rummy, we are pretty thrilled. It gives us a chance to sit around the table and visit while playing cards each night. They brought a new game with them this time called “Bohemian Poker”. It was really fun, and the hands are relatively short so that those of us with short-attention spans can concentrate. Without going into the details of how the game is played, mom reminded us all through the game (usually after a mistake was made) to “play your own hand”. Eventually I was able to do just that, but it did take quite a bit of repetitious reminding on her part. The opposite of “playing your own hand”, would be to look ahead at the person or persons after you and intentionally play in such a way that they do not benefit from your play. Some players go so far as to collect more points in their OWN hand to keep others from benefiting from their play. (The object of Bohemian Poker is to have the FEWEST points). Mom reminded the novice players at the table to concentrate on what would benefit them the most… to not look at other’s hands, and concentrate on your own. I suppose another way of putting it would be to “mind your own business”! So freshly ingrained is this new phrase, I have been thinking about how that applies to so much in our life. 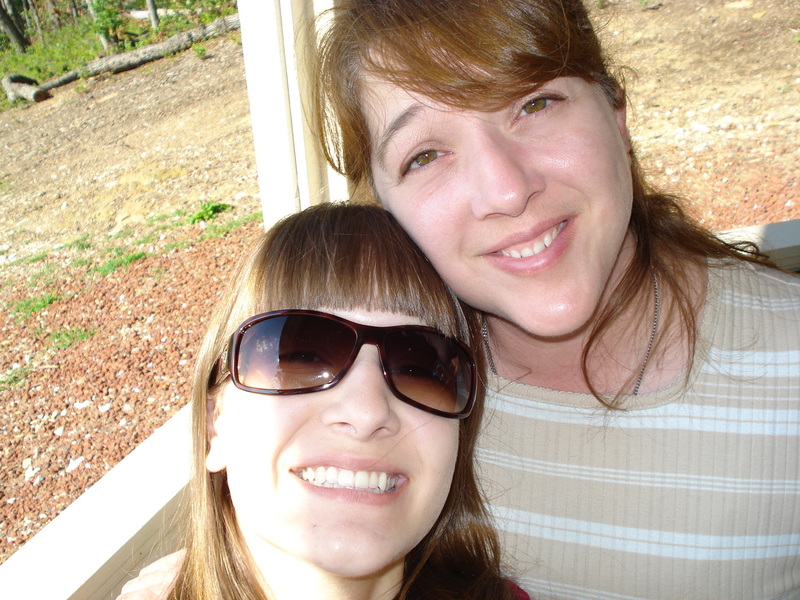 With her permission (and blessing) I decided to blog my thoughts on the idea! “Play Your Own Hand” does not mean that you intentionally live an isolated, segregated life. It does not mean that you ignore the needs and problems of others and concentrate on taking care of your “own” exclusively. It does not mean that when we see an opportunity to serve or minister in our community or circle of friends, that we do not reach out to those we see in need. “Play Your Own Hand” does not mean that you do not make short-term and long-term goals, for in truth, both are wise practices in the life of any adult. Sometimes those goals include relationships with others, and so we must determine how our goals affect those who are in our circle of influence. 1. Pay attention to what God has given you to do. Don’t worry about what others are doing as it is not your responsibility. Your choices, decisions, and planning ultimately affect YOUR life. 2. Don’t live defensively, countering wise decision for your life in order to keep someone else from benefiting. 3. There are gambles in life. They can be both exciting and nerve-wracking. May the chances you take only influence you, unless some benefit or blessing is passed on to another. 4. If someone you care about is ruining their life, try to be a good influence… pray for them… encourage them. But don’t allow their problems to become your problems. They may have some hard lessons that need to be learned through reaping the consequences of their own decisions. Hearing Loss – So Much Variety! I have met a great number of people with hearing loss through the years. Through speaking engagements, conventions, online support groups, HLAA and other hearing loss venues, I have discovered that hearing loss is not “one size fits all”. I have Meniere’s disease as well, and am amazed at the variety of symptoms and triggers individuals who struggle with this disease exhibit. “Play Your Own Hand” and do whatever it takes for YOU to hear best. To do so, insures you may communicate as best you can and to practice independence towards hearing all you can with the ears you have. Celebrate when others are learning to be proactive about their own hearing loss. Always be willing to try something new… you may learn a thing or two about your hearing loss even decades after you began living with these communication issues.